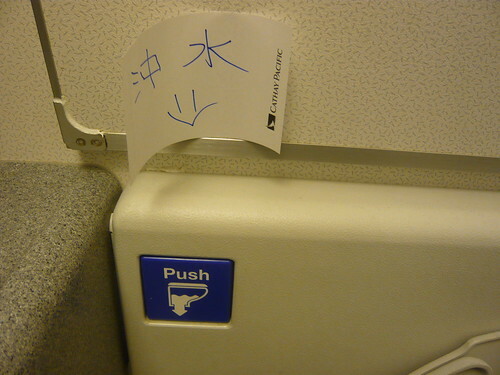 Saw this little post-it note on my flight from Singapore to Hong Kong. I was somewhat amused when I saw it. No prize for guessing who the note was addressed to judging from the language on the post-it note. I am not laughing so much that certain people need to be reminded to flush after using the toilet. Heck, we even have a national campaign and if I remember correctly, we even have a legislated fine penalty just for this. I supposed the purpose of this post-it note was more of an instruction since the targeted group don't read English and probably are first time travellers. We have entered a new era where the dragon awakes and its people start to take to the skies.